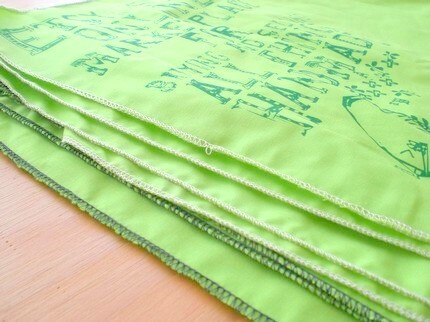 I just couldn’t resist snatching up a few of these bandannas from the Etsy Labs . I absolutely love the different style lettering and the little birdie. These Etsy folk come up with some super Etsy stuff. This bandanna inspired me so that I decided to make it into a cool little tote. Now it is romping around town spreading the Etsy word! Terrific idea!! 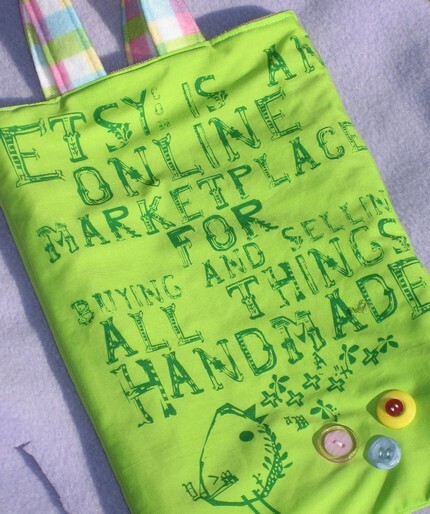 Very clever way to promote Etsy and it’s green, fits right in with all of the focus on Earth Day and “going green”. You are sooooo in fashion! I love the bag made out of the bandannas. Couldn’t find anymore of the bandannas though. Maybe they’ll restock. I’m loving this blog. I’ll be back to read. Will you be taking submissions for things other people have bought? very cute tote! I love the color!